Today I want to share this portrait out of my archives, again from the Streets of Chennai, India. 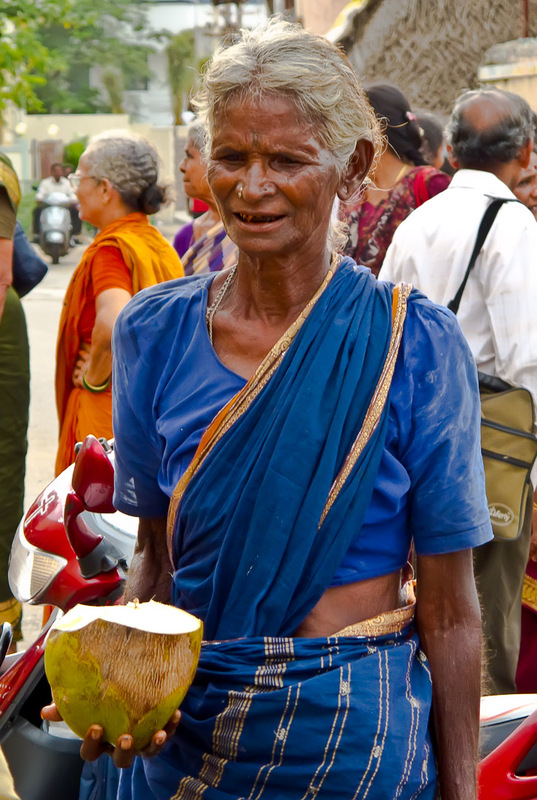 The lady just had treated herself to a coconut to quench her thirst on this very hot and humid afternoon. Beats a Coke, doesn’t it? Image taken with a Canon Powershot G11, specs are 1/160 sec @ f/4,5 and ISO 200. As usual when on the streets I shot in P-Mode. Thanks, I arrived safely 🙂 ! Great image! I would say happy travels but I think you know the drill. 😋 I hope you find a little sunshine during your trip Marcus!! Yep….brrr…subzero temps and snow flurries when I left the house this morning…longing for some real spring!!!! Thanks for commenting! Quite a life story captured in this photograph! Thanks, love this comment 🙂 ! I did some work in Saint Lucia a few years back and the highlight of the day was to stop on the way back to the hotel and get some fresh coconut water from one of the street vendors. I was told (and I don’t know how true this is) that, during WW2, they could inject coconut water into the vein instead of plasma. I could drink coconut water until the cows come home and even when the cows do come home, now need for cow’s milk if you have coconut water. Great comment and interesting facts – thanks so much. Indeed, there is nothing more tasty and refreshing like coconut water.